Inexperience is opportunity. Learning from mistakes promotes growth and develops confidence. But making unnecessary mistakes is foolish. Don’t learn everything from personal experience. 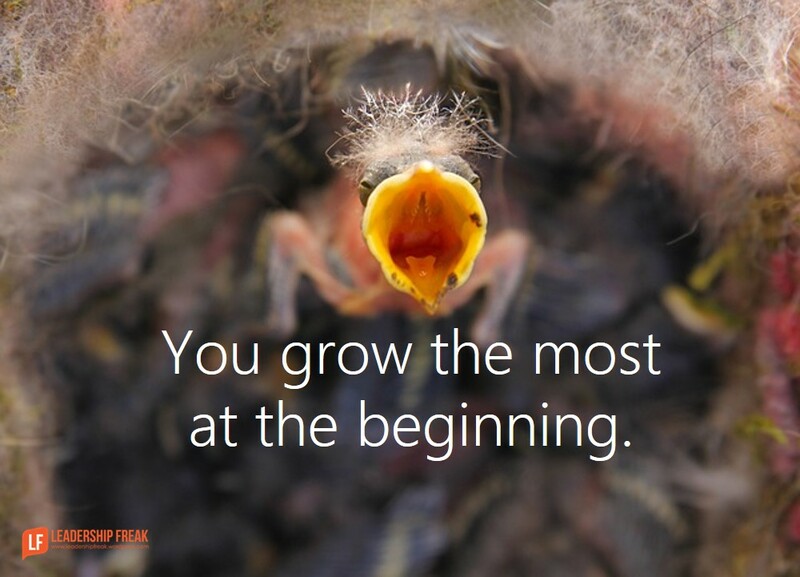 You grow the most at the beginning. Wise leaders learn from the experience of others. Priority #1: Personal development and well-being. Priority #3: People development and relationships. You’ll spend most of your time working in and on your business. Just don’t neglect your priorities. #2. Working too hard. A bias to action – something most leaders possess – leads to low performance as time passes, unless you learn how to prioritize and rest. Learn to trust the people around you. You can’t bring your best when you’re lost in the business. Based on my use of time, what are my priorities from your point of view? Based on my interactions, how am I making others feel about themselves? Based on my strengths, when am I at my best? #5. Having all the answers. Tap into your ignorance. The practice of “not-knowing” elevates leaders more than having all the answers. Lead with confidence while staying curious. Promoting new people too soon. Assuming others know what you want. Assuming you understand people’s motivations. What mistakes do new leaders make? How might new leaders avoid common “new leader” mistakes? Wow! So useful and timeless; all excellent! The only thing I might add, although it could be implied from some of the other points, is “Seek a trusted mentor -if you don’t already have one.” I was fortunate to have a mentor before I was promoted into a formal leadership position. His advice, including some of these same points, was invaluable to me getting my feet on the ground without falling flat on my face. I would also add that the “bonus mistake” of micromanaging is one of the easiest for the new leader to make. You can guess how I know! Thanks Jim. It truly is a huge mistake to not have a mentor and/or coach. I’m so glad you added this essential concept. Great add! One of the best things I did when I received one particular job was to contact a person who’d had a very similar job about 20 years earlier. What I asked him to do was to mentor me, even though I expected to have several others who hold similar positions to my new job. He agreed but asked that I keep that part of our relationship to myself (and I did). By the time we got to the beginning of year 2, I asked for his evaluation of how I was doing. When we met, even though we’d met several times throughout the years brought out two yellow tablets, one with good stuff and one with issues he’d thought would cause problems with my higher ups which was fortunately short. Only two of those had actually raised issues – both because I wanted to give two people raises because both had performed at very high levels while expanding their own skills beyond their jobs’ requirements. He was right that my two up manager would be upset, but I was well-prepared when I faced the two-up. One of the people was an Hispanic woman while the other was an Afro-American man and both had been denied raises apparently because of their ethnicity. When the two-up asked why I’d give them a raise I told him the same things I’d told my mentor. He looked like he was about to explode, but I got the approvals for the raises. My point here is that I thought that attitude should have been gone by 2008! When I found it wasn’t, thanks to my mentor, I was able to prepare several responses and use the appropriate one when I met with the two-up. Thanks VR. After reading your comment, I’d have to say that not having a mentor or coach may be the #1 mistake of new leaders. Your story is compelling. As a coach, one of the things I do is help leaders work through challenging situations. It’s so useful for them to plan board meetings, crucial conversations, and next steps. You and Jim really nailed it. Dan, Great as always. New leaders tend to promise then fail to deliver similar to some politicians. Leaders need to follow the courses they project and finish what they start. Granted in the real world courses need altered due to poor planning, missed sequence of events, and unique circumstances that do develop from time to time. Leaders need to trust their management team as well, delegation plays a key role to manage the company too! Thanks Tim. Wow, another great addition. I’m so glad you stopped in again. I think follow through builds trust. Lack of follow through lowers trust and respect. You nailed it. Dan, great list. What I hear the most as a coach, is the new manager stays “in the business” too much as it’s hard to shift from “expert” to manager/leader. There is a tendency in us all to want the people to succeed by virtue of learning from our own experience. This is great for counsel, but can run into micro-managing and not allowing subordinates to grow and develop on their own. The goals becomes to build their staff’s competence and confidence. The challenge for the new leader as you mentioned above is to shift their focus and learn from their new challenge as a manager from having all the answers. Thus having an oboarding development plan for a new leader, or a leader taking on a new role is a must. Chasing too many opportunities is certainly a mistake made by many new leaders. This is an easy trap to fall into for any leader. When you think of the possibilities it is easy to be distracted by the new shiny object. 2. As a general companion thought to this post, I am reminded of the late Stephen Covey’s “Four Needs” – Academic, Physical, Social, and what I refer to as Internal. They all apply to your career AND personal life. Love that the priorities of Mistake #1 are personal really! To me, the keystone is the Internal need: periodically (I do it each Sunday morning) find a quiet spot and ask yourself how the other three needs are being met AND what changes you might make to make them go better. All FOUR needs are equally important – including the fourth!! !